Can you believe it’s already the middle of March!? This school year is flying by…and so is the list of titles I’ve booktalked so far. I’ve exhausted the bestsellers of YA, dystopian sci-fi, classics, books for the beach, war books, and sports books. At this point in the year, I’m starting to booktalk new purchases, which means I’ve often not yet read them–which means that sometimes, the quality of my booktalk decreases. So, because I want to shift the balance of not just grading from myself to my students, but also some of the teaching, I’ve turned to my own version of March Book Madness. I heard about this competition from Tony Keefer’s Nerdy Book Club post, and I pitched it to kids, but they wanted to choose their own titles for the bracket. 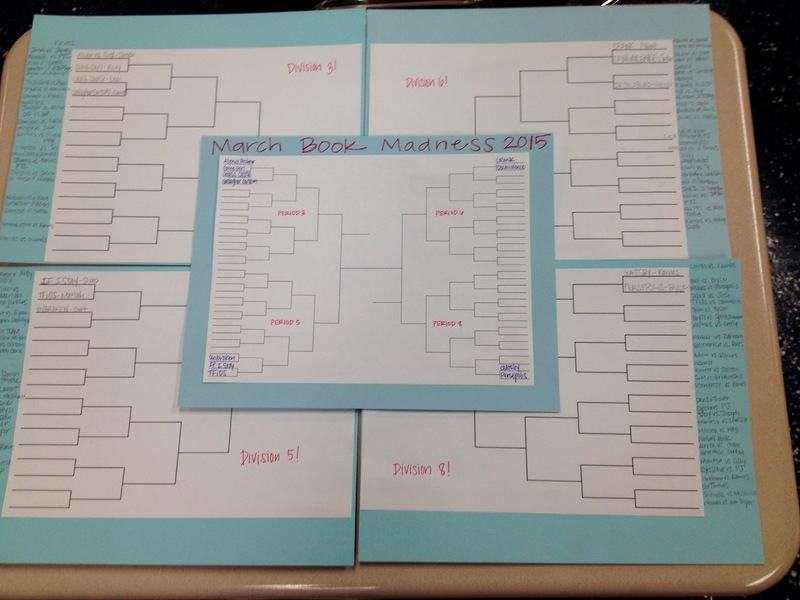 So, blank brackets were printed, and to fill them, the guidelines were broad: in each of my four English classes (which worked out well because they each get one corner of the bracket), students could choose a book and a partner to face off against. Simple. 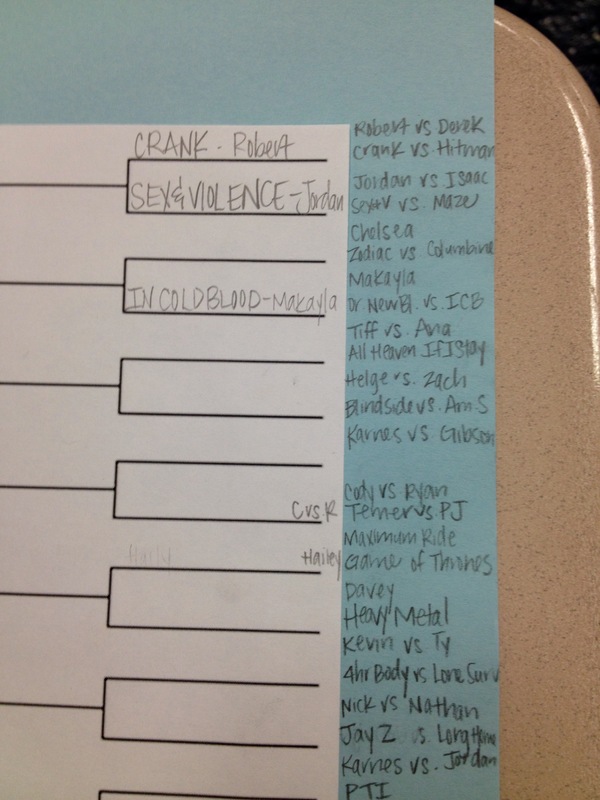 That was all I said, but as students began penciling in round one of the brackets, I was impressed mightily–they intuitively paired related books together, much like I do during booktalks. Two boys in 8th period paired the excellent graphic novels Persepolis by Marjane Satrapi and Maus by Art Spiegelman. 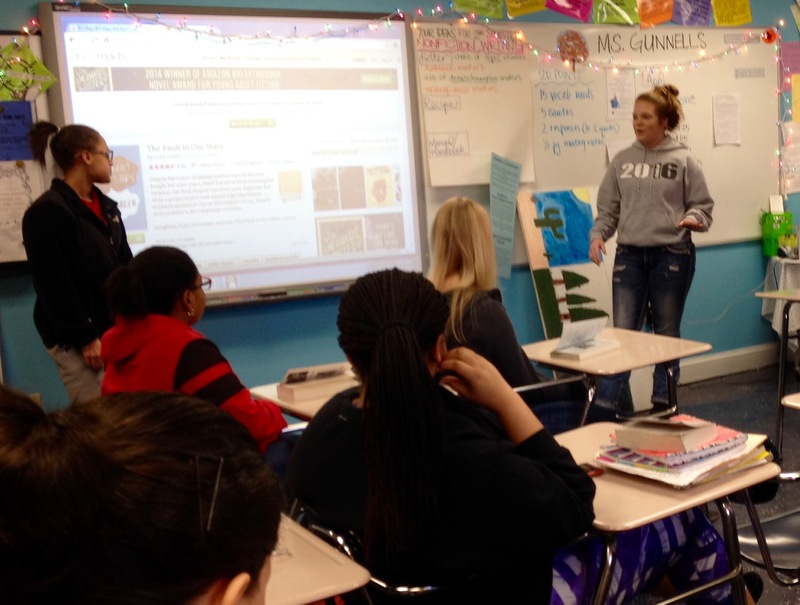 Two girls in fifth period paired John Green’s The Fault in Our Stars and Gayle Forman’s If I Stay–two viral tearjerkers. The Absolutely True Diary of a Part-Time Indian by Sherman Alexie will face off against Mexican White Boy by Matt de la Pena in sixth period. And so on. As book battles began, I laid out equally simple guidelines for voting. Each student in a faceoff would give a short (1 minute) booktalk about their chosen text, and audience members could vote for one title based on any criteria–their own experience reading that book, the person’s booktalk, the presenter’s enthusiasm, the book’s stats on GoodReads behind the presenters, etc. This modification to our daily routine–which is that students begin with reading, then hear my booktalks–has accomplished several wonderful things in our classroom. First, students’ what to read lists, which had recently plateaued, are lengthening rapidly once more. The sheer social capital of having a kid share his or her own reading experience of a book makes certain titles more tantalizing than I ever could. Matthew Quick’s Sorta Like a Rock Star, for example, never quite flies off the shelves after I booktalk it. It’s only after one or two kids read it and enthusiastically share it that it goes viral–and it does–year after year. I see the same thing happening now during March Book Madness with lots of other books. Kids are clamoring, suddenly, for several of the same titles. Second, students are learning more about one another’s reading tastes. They look at the brackets from other classes every day to see which books are advancing, and are sometimes surprised by who’s booktalking what. “Huh…I didn’t know Jordan loved A.S. King too!”, I heard Hannah say yesterday. “You read that book too!? Wasn’t it awesome? !” Tyler said to Hunter, as he stood up with Ned Vizzini’s Be More Chill. Despite my efforts to make their reading lives transparent with reading groups and notebook passes of book blogs, some of my larger classes haven’t quite unearthed the darkest corners of one another’s reading preferences. MBM is fixing that quickly. Third, this is not for a grade. This is just a semi-structured celebration of books, with bragging rights as the purely intrinsic reward of the whole endeavor. The five or so minutes we spend on this in class daily are a worthy time investment for the revelatory feel they bring to the start of our learning. Kids are excited and upbeat after the two daily faceoffs, and excited to often add one or more of the four daily books discussed to their to-read lists. The post-winter doldrums are quickly lifting…and the sunshine certainly isn’t hurting, either. Is anyone else doing a version of March Book Madness? How’s it going? Please share in the comments! Excellent idea Melissa! I’ll have to pass this along to our librarians. Shana, this is exactly the jump start many students need during the early spring. It gets kids excited and engaged again. Love it! We decided to do a school-wide March Madness bracket using the Top 64 books that have been checked out in our library so far this year. We gave English teachers the brackets and had them do a prediction challenge in their classes. (http://goo.gl/lxA3Nu ) Each week we have created a google form for students to vote to narrow down the bracket. This is our first year doing it so it is definitely a work in progress, but it has been fun listening to students talk about the books and add them to their to-read lists. Thanks! It helps that as the literacy coach my office is up in the library. Our librarians are more than willing to do whatever they can to get the right book in a kid’s hands!